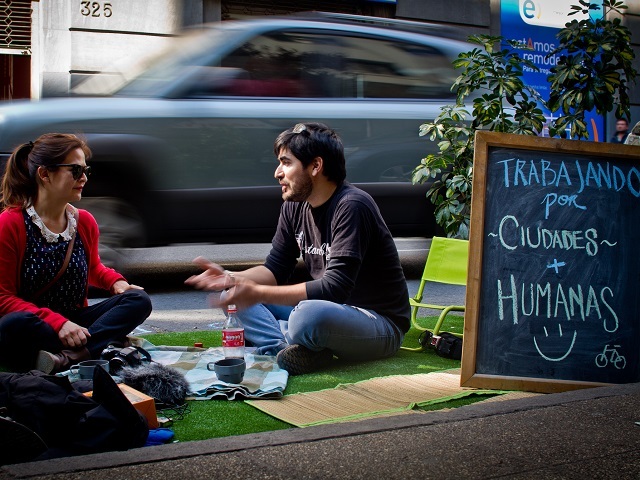 Urban guerrillas in Santiago, Chile with a sign that reads, “Working for cities and humans.” In 2014, aim for a broader impact from your New Year’s resolution – an impact that benefits not only you but your city and planet, too. Photo by Claudio Olivares Medina/Flickr. Happy New Year, readers! It’s that time of year again – the annual establishing and kick-off of New Year’s resolutions. But this year, let’s take a different approach. It’s easy to make lofty New Year’s resolutions that make an impact at the individual scale – if you follow through. In 2014, how about trying a resolution that will not only benefit you, but your city and the planet you share with seven billion other humans, as well? As Zipcar founder Robin Chase reminded me earlier this year, what’s really important today is taking actions that can scale. By committing to one (or more!) of the following resolutions, aim for a broader impact from your New Year’s resolutions this year. 1. Use the most efficient mode of transport for every trip. In most cities, there are a myriad of transport options at your fingertips. Take a moment before each trip to make sure you’re making the most efficient choice. You might be surprised to find that often, the sustainable choice – be it walking, bicycling, or riding public transport – is also the most convenient in urban environments. Remember the Avoid-Shift-Improve framework: avoid unnecessary trips, shift necessary trips to the most efficient modes of transport, and improve the energy efficiency of transport systems and vehicle operations for the necessary trips. We can all help avoid and shift, but if you do need to use a car for a trip take advantage of the exploding car-sharing industry, or carpool. 2. Be kind while riding public transport. 3. Help build community in your city. The Washington Post recently reported that being more connected to your community provides you with more resources and a bigger safety net in times of financial trouble. Robin Chase has emphasized that “community muscle-memory” helps boost resiliency to big challenges like climate change. In 2014, let’s work to cultivate community engagement as a norm in order to make our cities stronger, more accessible, and more livable. 4. Pass it on – educate your friends and family about the benefits of sustainable transport. You know it and we know it: sustainable transport is an all-around good choice for your city, your planet, and you. This year, help spread the word by outlining the many co-benefits for your friends and family. Let them know how they can help improve traffic safety, decrease local air pollutant and greenhouse gas (GHG) emissions, and boost the health of the public and themselves through making smart transport choices each and every day. From all of us here at TheCityFix, here’s to a healthy, happy, and safe 2014!